Nothing’s more important than tackling your daily responsibilities and the demands of your job. So, when you need some extra power and muscle to haul some heavy cargo, the answer to your performance prayers is here in the form of the 2018 Ram 1500. With all the innovative features loaded into this mighty truck, it’s no wonder that you’re eager to learn more. Well, you can do exactly that by reading through the exciting specifications contained in this Buyer’s Guide to the 2018 Ram 1500 eBook. In addition, this all-inclusive manual comes packed with a bundle of convenient coupons that’ll help you save some cash when you’re ready to purchase your Ram 1500. 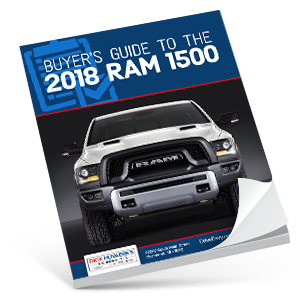 Don’t hesitate to dive into all the informative facts contained in this Buyer’s Guide to the 2018 Ram 1500 eBook. Start your journey by clicking on the link and downloading your copy today! Before long, you’ll be an expert in every aspect of this tough pickup.